so many to choose from. Each is one of a kind. Prices start at $10. 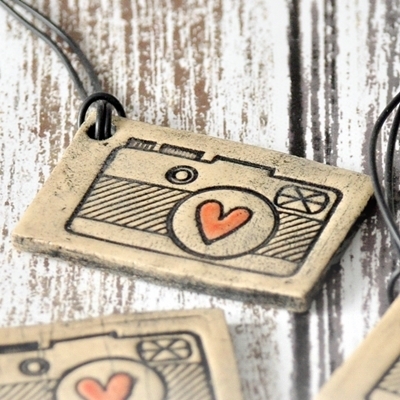 Handmade hanging camera ornament, whether on the wall or adorning a tree, this unique ornament will be a conversation starter. It may be used as a gift tag as well. This would be a great gift for the shutter bug in your life, or a thank you gift from a photographer to their client. Made of stoneware and kiln fired for durability. Glazes are non-toxic. “Strap” is made of rubber cord. Measures approximately 2.25″ (5.7 cm) x 1.5″ (3.8 cm). *Bulk ordering & pricing is available for this item. (Minimum 2 dozen). There will be additional production time required. 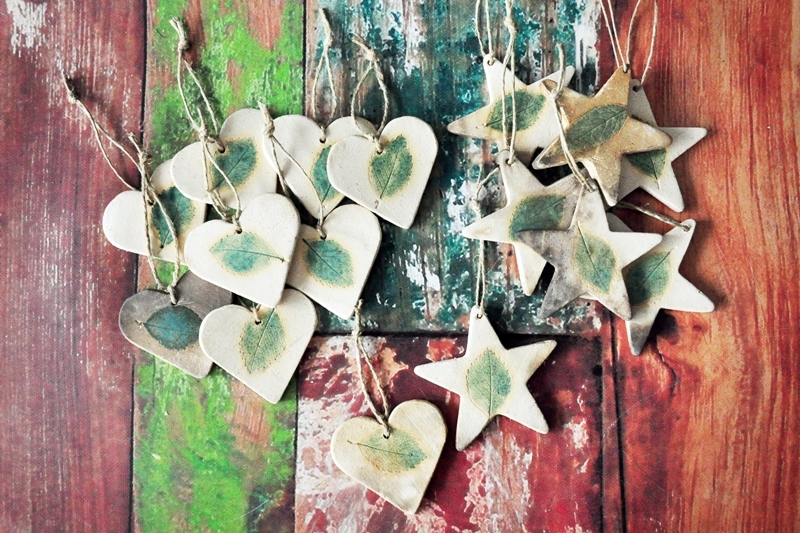 Earthy and naturally beautiful heart and star ornaments or gift tags that will be right at home in a rustic décor. The pit-firing process adds to each one’s individual character as no two turn out the same. Specify heart or star when ordering. Oak leaves may also be available. Stars measure 2.25″ (5.7 cm) across. Hearts measure 1-7/8″ (4.8 cm) across. 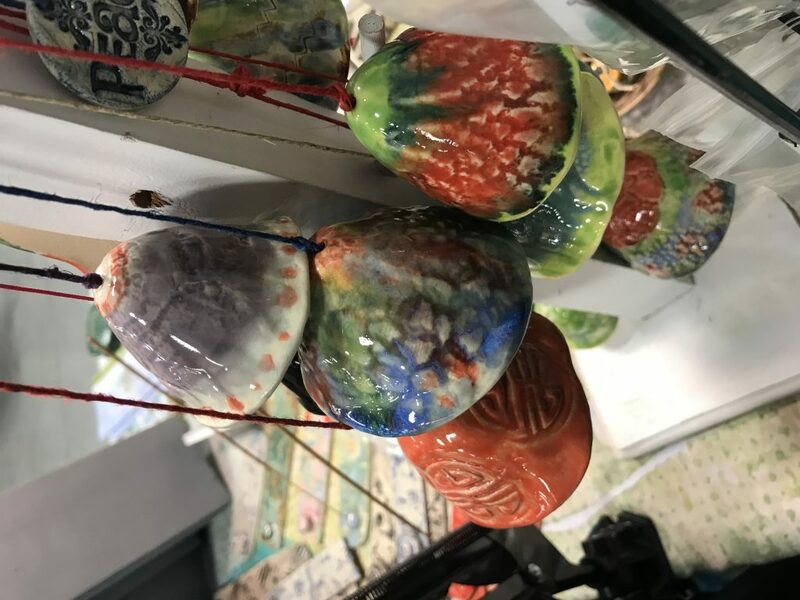 Hand formed bells which have been imprinted with real leaves. The pit-firing process, with which it is made, lends an earthy quality. Only the leaf has been glazed, providing an interesting contrast. Bells are strung with durable natural hemp string. Hang them indoor or out, but take inside for the winter. It is a good idea to seal the bell with Vaseline and wipe off well if you plan to keep it outside, otherwise the smoky color will fade over time. 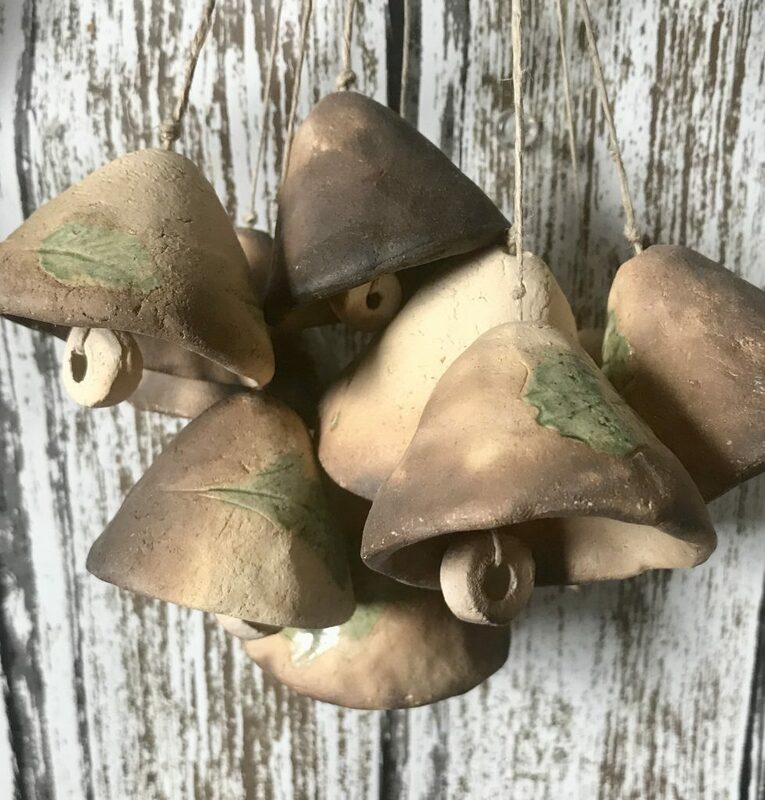 If you want, hang a few together and create your own wind chime. Prices start at $10. Various sizes and leaf types are possible. Handmade components were used in the creation of this little wind “charm”. Indoor-outdoor. Looks perfect in a window.